“I think Robert is brilliant and I love my lessons with him as does' Fred' (Overdrive). I learn something every time he teaches me and he always manages to improve the horse and rider with out making his instructions too complicated. I am most impressed that he always regards the comfort of the horse as being of prime importance and consequently achieves a very satisfying result. 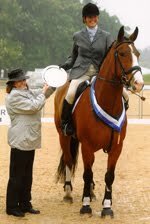 The picture is last year at Windsor, 2009, when Overdrive won for the fifth time! We had a very good lesson with Robert the day before. He is now retired from showing, age 20, apart from Veterans. “ Georgina Andrews. 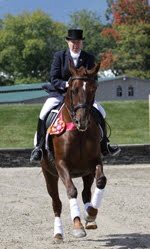 "I had the pleasure of riding with Robert way back when he was Chief Instructor at Wellington Riding. When he went freelance, I became one of his first regular students. 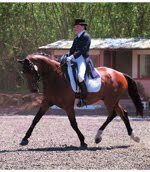 Over the years, Robert not only helped me improve my dressage riding and results in British Dressage competitions, he helped me become a successful horse trainer. Robert guided me through the starting of two KWPN youngsters, both of which turned out to be well adjusted wonderful riding horses with excellent competition histories. Robert's kind personality shines through in his lessons. He never speaks a harsh word, always demonstrates respect for the riders, and has a true appreciation for the horses and their efforts. 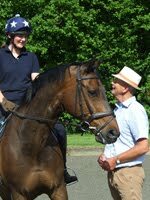 This makes training sessions with Robert both productive and fully enjoyable for both horse and rider. 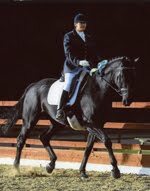 I had to stop training with Robert in 2005 when I moved to the USA and opened my own dressage training centre. I'm still looking for my next trainer, but in the meantime, whenever I train my horses and my own students, I often hear Robert's advice and guidance in my head. My clients all train with Robert, they just don't know it! Robert Pickles has been my friend and mentor for over 20 years. His ability to train both horse and rider inspired me from a young age and his experience and enthusiasm has been instrumental to the development of my career. 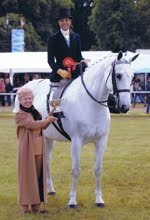 In 1990 I was a student at Wellington Riding where he was Chief Instructor and, under his guidance, I achieved my Intermediate qualification. More recently, his encouragement to further my training has inspired me become a BHS Stable Manager and work towards my Senior Coaching exam. I regularly attend his inspirational workshops and training days where his energy and dedication is unsurpassed. Lauder and I have progressed a lot since I have been training with Robert. He has not only helped me develop Lauder's strength and way of going, but he has also helped me become a more positive rider with a better understanding of how to train a horse. His help has been invaluable and it has been reflected in our scores at competition. 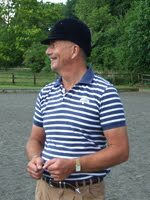 Last year under Robert's tuition, Lauder and I achieved my gaol of scoring +70% at Advanced Medium, not once but twice"
Peter Warren, an amateur rider who lives on the Isle of Wight, attends Robert's clinics on the island which are arranged by the Isle of Wight Riding Club. 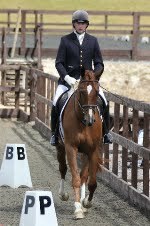 Peter and Litchfield Carson regularly qualified for BD Regional Finals at Preliminary and Novice Level, also taking the highest placed amateur owner/rider award. Sadly, Carson had to be put down very unexpectedly through ill health before he could achieve greater things. 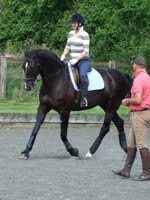 Peter now has a young Belgium Warmblood (Ollie) who he takes to Robert's clinics and who is progressing well under Robert's careful and patient tuition. Hopefully, Ollie will become another horse from the Isle of Wight, trained by Robert, who goes on to achieve great success. The Isle of Wight Riding Club have been arranging monthly visits to the Island with Robert Pickles for approximately three years. "Robert has a talent for teaching and getting the best from riders of all ages and abilities. This is reflected by the fact that his clinics on the Island are normally over-subscribed, with a waiting list of people ready to have a lesson if a space becomes available! Since Robert's regular clinics have been taking place, Isle of Wight Riding Club members have competed, qualified, won and been place at British Dressage Regional Finals, British Dressage National Championships, Petplan Area Dressage and Combined Training, Petplan Championships, Riding Club Area and Championship Eventing, Showjumping, Dressage and Dressage to Music. Their successes are a testament to his way of teaching." Training with Robert is always a pleasure. He works on both the horse & rider, and always has new exercises to help improve the horses way of going. I highly recommend him. Duncan Whitney-Groom. Equine Competitions & Events Manager. Merrist Wood Campus. Guildford College. Vagebond VD Withoeve Z (affectionately known as George), being ridden by Charlie Samuel-Camps, gained over 70% in both Prelim tests on their first BD outing and were placed 1st and 2nd. I have had help from Robert with various horses since 2003 and he is always an inspiration. At the end of every lesson you feel confident to put into practice his advice and guidance to hopefully make progress ready for the next lesson. 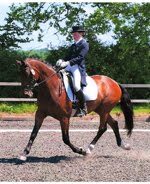 Having lost some confidence from not competing for several years, Robert kindly found George for me and he could not have chosen a more suitable horse – kind, quiet and with super paces at a reasonable price. Everyone I know benefits hugely from Robert’s teaching – I am pleased to run regular clinics for him and hope to carry on riding into my dotage with his help.